While there are enthusiasts who insist that digital can never fully replace film, photographers and DPs (directors of photography) who have worked in the industry for a very long time are beginning to accept that digital CAN, in fact, replace film and more. This debate started when SONY released the Mavica a while back using light sensors to capture an image and save the image data into a floppy diskette. 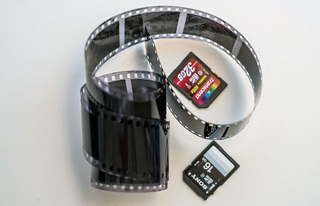 The idea was to use a sensor, similar to those used in document scanners, create a body to house it, and add a lens to adjust focus which is essentially similar to what a film camera does. The only difference is how the image is captured and processed. But if we go back to the basics, photography (even in motion photography or filming) has always been about light and a photograph has always been about capturing that light in a specific instance. If you have more than enough light, you'll get an over-exposed image. If you don't have enough, you'll get an under-exposed image. It's how light affects surfaces that gives everything its color, hue, intensity, etc. and how those properties enter our eyes and how those are processed by our brain that makes up the complete image. And that's what all this boils down to -- how we perceive the final result. So, to simplify everything, we should simply treat all of these as tools that we use. While it might be true that, at the moment, film surpasses digital sensors (because they can capture light at a wider range), this may no longer be true in a few years. And with the improvement of digital photography technology growing each day, bulkier film cameras and the amount of time to process the photos is beginning to look like too much of a hassle and too much expense to take that one (or 24 or 36) shot that may or may not have been captured perfectly. But in a studio where details are of utmost importance and where everything has been carefully calculated and perfectly placed, capturing images in film may still surpass digital photography. So, in conclusion, it's the right tool for the job. If you need to be on the move and need to see results immediately for that quick retake, just in case, digital might be best. But if you are looking to save something for posterity at the highest possible details in a complete, controlled environment, film may be the way to go. So let's stop bickering about which is better -- because if you used a gas stove or an electric stove, you still end up with a meal.